Especially in the summer and fall, Outlook Farm draws people from all over the region for apple picking, harvest festivals, pig roasts and other attractions at its spread on Route 66. It’s not unusual on a fall weekend to find its small store and restaurant so packed it’s tough to even get to the shelves of produce or the deli counter for its locally produced selection of meat. After five years of planning, a year of construction and a $1 million investment, Outlook Farm is hosting a grand opening celebration this weekend to show off its new expanded store, which includes a new 3,000-square-foot barn modeled after a traditional post and beam barn. Bradford Morse, who runs the farm with his wife, Erin, said they are thrilled to more than double their space. The store was 2,400-square-feet before, but half of that was an apple cooler. 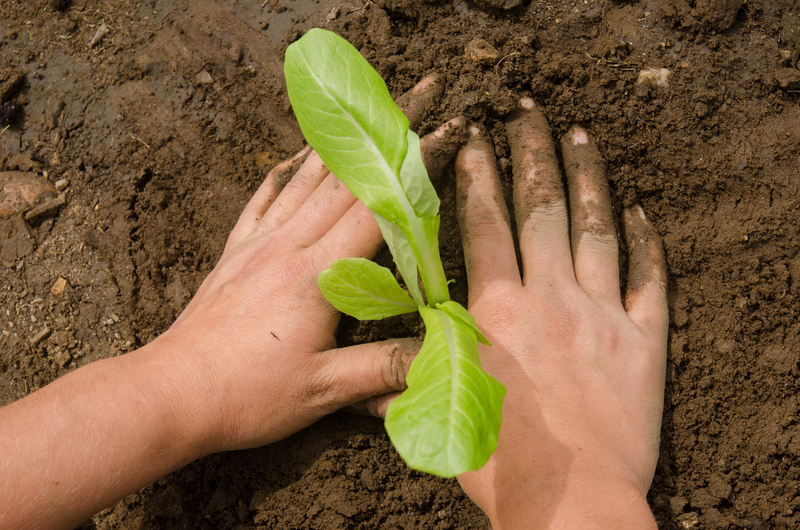 “We’ve been growing a lot for the last five or six years,” he said. Morse credits the “buy local” movement with drastically increasing the demand for his produce and pork. Outlook Farm is not the only Valley operation looking to provide more produce through a store thanks to aggressive buy local initiatives. Atlas Farm in South Deerfield will open its farm store at 218 Greenfield Road May 3. The farm, owned by Gideon Porth, previously sold its organic produce wholesale, at farmers markets or through farm shares. Porth purchased the farm store building, previously used by Deerfield Farm, along with 40 acres of adjacent farmland. “It has been a long-term vision on the farm to do this and this was a great opportunity,” Porth said of the purchase. The store will sell Atlas Farm produce as well as other local products like milk, flour and pickles, according to the Atlas Farm website. Devon Whitney-Deal, of the South Deerfield nonprofit Community Involved in Sustaining Agriculture, said though several farm stores have opened in the Valley in the last five years, it’s not quite enough to be considered a trend. It is, however, a sound business move, if perhaps also a bit complicated and capital intensive. With his farm store expansion, Morse said he will probably hire six new workers, from counter help to managers. At the peak of the season, the farm employs about 25 people, he said. Currently, the store’s retail shelves, meat counter, kitchen and restaurant seating is all located in the 1,200-square-foot front of the store, with a lot of the produce being displayed outside on the porch because of the limited space. Contractors have transformed the 1,200-square-foot rear room of the store, which previously served as the apple cooler, into additional retail space. When the shelves and products are relocated there, it will allow for the restaurant that offers breakfast and lunch to expand in the front of the store and double its seating to 50. “We have really limited seating — when you get the regulars in, there’s no room for anyone else,” Morse said Tuesday while surveying the crowded seating area. Customers who walk to the far side of the former apple cooler space will find themselves in the meat market, where they can choose chicken, pork and beef from coolers or ask the meat cutter for a special cut of fresh pork. Previously, Morse said the meat counter was cramped in the small store and all the cutting was done in a different building, so meat could only be cut to order with advance notice. Morse said the pork he sells is from Pennsylvania pigs slaughtered at Adams Farm and Slaughterhouse in Athol, so it arrives at Outlook Farm very fresh. “And pork is really best fresh,” he said. Beyond the meat market is the recently completed, two-story barn, which will house most of the store’s produce as well as things that the store has never had the space to carry before, such as bulk quantities of local potatoes. Morse said he also hopes to have local artisans such as potters and quilters sell their wares here, as well. One end of the barn is dominated by the 1880s cider press that the farm used to produce about 4,000 gallons of cider last year. It’s been on the farm since 1968, Morse said, but was located in a different barn. The barn was designed as an improved replica of a late 19th-century barn that originally stood on Kennedy Road in Leeds. That barn was dismantled and given to Morse, but it blew down in February 2009 while it was still being reconstructed at Outlook Farm. Morse said that was a huge disappointment, but he learned his lesson. “This barn is a duplicate but with beefed up engineering,” he said. Timber framer Neil Godden of Cummington designed and framed the barn and Westhampton contractor Ronald Lamagdaline — a regular customer — built everything else, Morse said. He’s feeling optimistic about his crops this year, including the 30 acres of fruit tree orchards. Although there have been a couple frosts, the temperatures weren’t low enough to do any damage to the fruit tree blossoms, he said. He owns and farms 60 acres of land, half orchards and half ground crops, around the 136 Main Road store. He also rents another 30 acres around town. The barn grand opening celebration on Saturday and Sunday will feature live music, pig roasts, barbecues, special sales, a chili cook-off and community craft and tag sales on both days from 8 a.m. to 2 p.m. 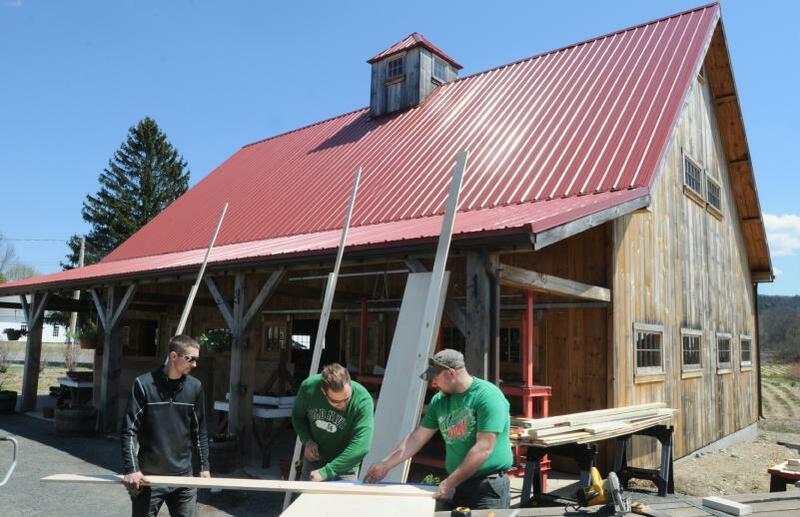 The Atlas Farm Store will open Friday at 8 a.m.
left, Tom Devine, Stephen Giard and Robert Brennan, all employees of Kevin Gray Building out of Northfield work on the barn at Atlas Farm.